You love your feline, but despise dealing with the litter box. After pushing your cart past a massive selection of scooping litter at the pet store, you come across a small section of scoop-free litter. You have several varieties to choose from and they all have different ingredients. You may need to try several until you find one that keeps Max – as well as your nose -- content. 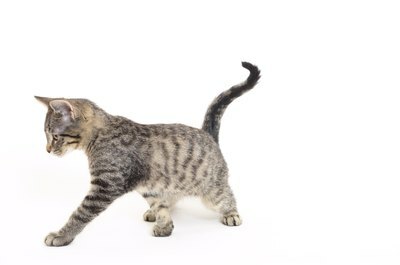 Traditional non-clumping litter was the very first type of kitty litter. In the 1940s pet owners used sand or ashes from the furnace to fill the kitty pan. Since sand and ashes were messy and not very absorbent, an ex-sailor realized that clay – a product used to absorb industrial spills -- might be a better fit. Clay is a natural component of the earth, containing bentonite, sepiolite and diatomite, among other natural mineral components that absorb liquid and draw it down to the bottom, away from the surface of the box. Some types of scoop-free clay litters also have baking soda and fragrances to help eliminate odors. Silica litter has been around since the late 1990s. It’s simply highly absorbent little pieces made of silica dioxide sand, oxygen and water. Each little particle absorbs up to 40 times their weight from fluid waste, reports VetInfo. It doesn’t clump, rather it just soaks up urine. All you have to do is scoop out solid droppings on a daily basis and stir the crystals, allowing liquid to absorb evenly. Some brands are scented with perfumes, aiding in odor control. Pellets are another way to go if you want an alternative to scooping litter. Manufacturers of pine litter grind pine pieces into a fine dust. During processing, they compress the dust into tight solid pellets. Newspaper pellets are produced in the same way – grinding old recycled newspapers into a fine grain and compressing the mixture into pellets. The only ingredient in pine pellets is just pine, whereas newspaper pellets just have newspaper. Some varieties may have added fragrances, but they'll be labeled as such. The list of other ingredients and types of scoop-free litter goes on. You'll find litters made from dried and processed orange peels, crushed peanut shells, ground corn cobs and even plain old bags of dried wheat marketed at kitty litter. Because some of these products may be a little uncomfortable for Max's paws, it may take him some time to get used to and some cats are finicky. Blend his old litter with the new stuff, with one part new litter to three parts old litter. The next time you clean out the box, the mixture should be half and half. Eventually as long as Max uses his litter box and doesn't have any outside accidents, you'll be able to completely switch over to the new scoop-free litter.